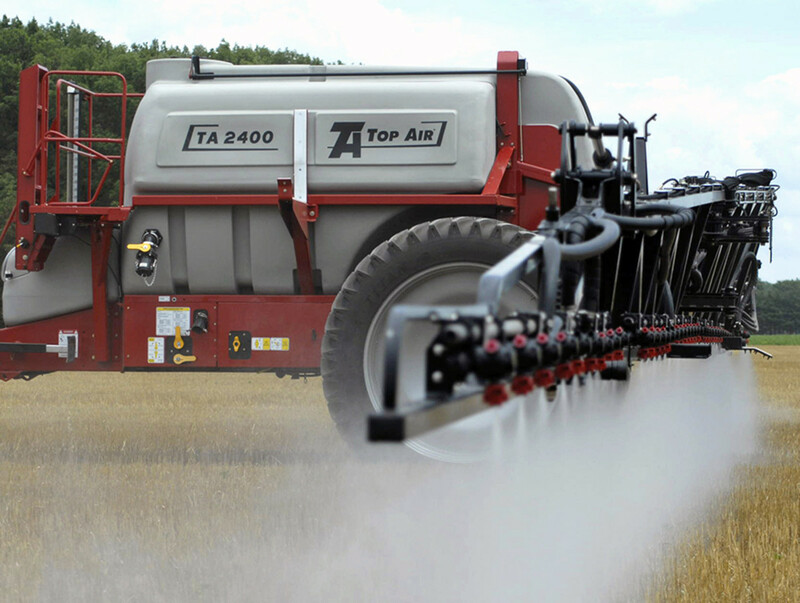 The Premier line of Top Air T-Tank field sprayers are equipped with more standard features than any other pull-type sprayer on the market. The custom molded, T-shaped tank is available in 2400, 1600 and 1200 gallon capacities and features a containment sump for holding the last 30 – 50 gallons of liquid on side-hills and inclines. 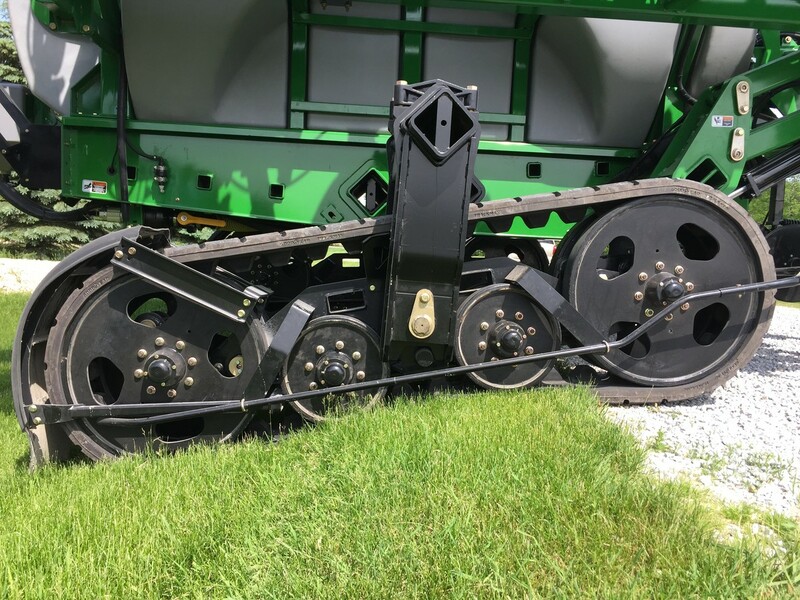 Boom widths are available from 80’ up to 132’ for covering maximum acres in minimal time and feature shock absorbers and hydraulic cushioning for smooth, level performance. FLO-BAK® ball valves automatically return any remaining liquid in the plumbing at the time of shutoff back to the tank rather than wasting it out of the boom, saving chemical and money. 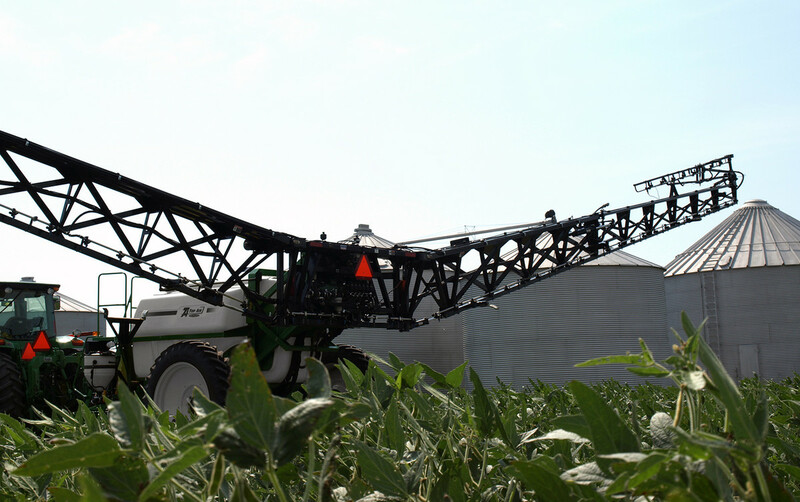 Other standard features, such as the independent rubber-cushioned axle suspension (optional on 1200), stainless steel boom plumbing and hardware, electric tank agitation, outer wing spring-loaded breakaway, and ISO rate control are just a few of the details that put the Premier sprayer ahead of the pack. Choose from single wheels and tires, dual wheels and tires or the industry-leading Equalizer track depending on model, to meet individual preferences. 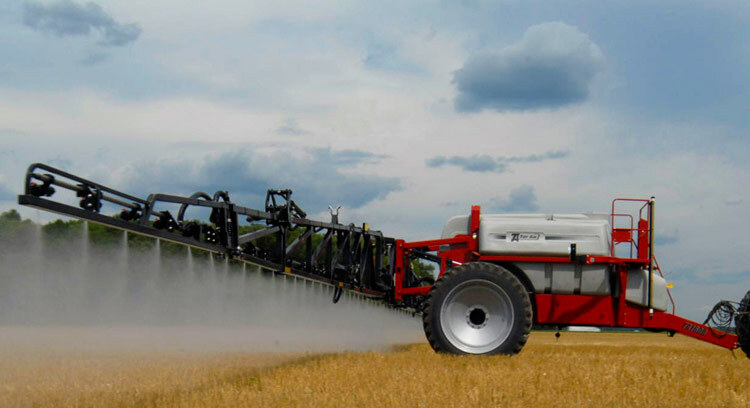 Combine these features with longlasting quality and you’ll see why the Top Air lineup of Premier T-Tank pull-type field sprayers truly are beyond comparison. Tank capacities of 2400, 1600 and 1200 gallons with a separate 165 gallon rinse tank make cleanup and changing mixes quick and easy. Exclusive T-shaped tank design is custom molded from a gray colored UV resistant polyethylene and features a containment sump that holds the last 30 – 50 gallons of liquid, keeping the pump primed on side-hills and inclines. Stainless steel tank baffle on the interior of the tank provides load stabilization. 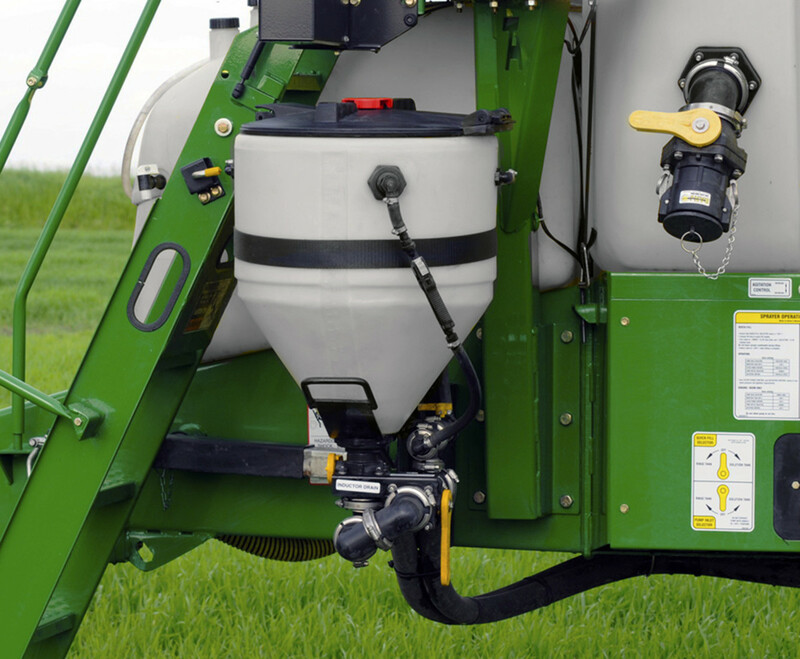 Electric tank agitation controls are located both on the sprayer frame and the in-cab controls for a 5:1 mixing ratio for rapid chemical mixing. 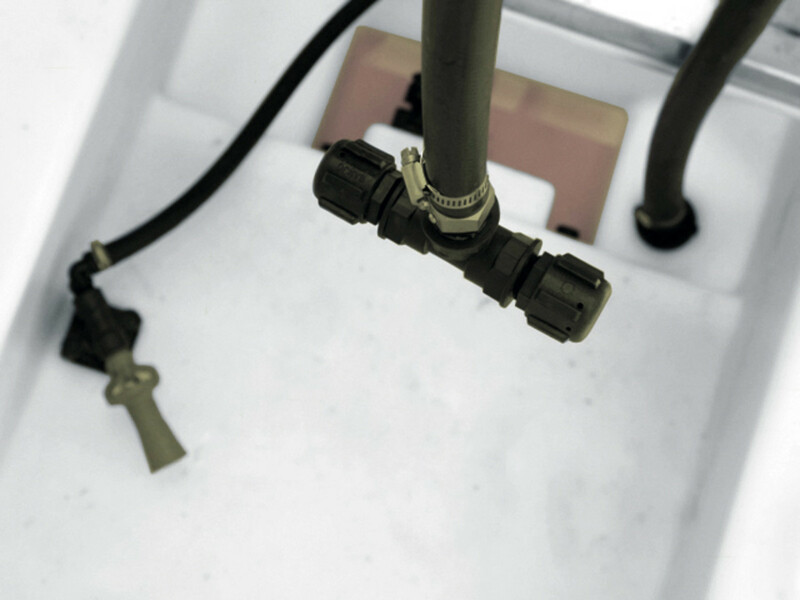 Dual rinse nozzles, located inside the tank, provide quick and easy cleanup from one solution to another. 165 gallon rinse system on models 2400 and 1600 and 140 gallon system on model 1200 offers a secondary water source and ample capacity for cleanout. Hydraulic Ace 750 PWM run-dry pump on model 2400 and Ace 205 PWM pump on models 1600 and 1200 for applying the right amount of liquid at the correct time. 3” quick fill on models 2400 and 1600 and 2” quick fill on model 1200 permits quick and easy filling from the ground level and a 16” top manual fill lid for easy tank access. 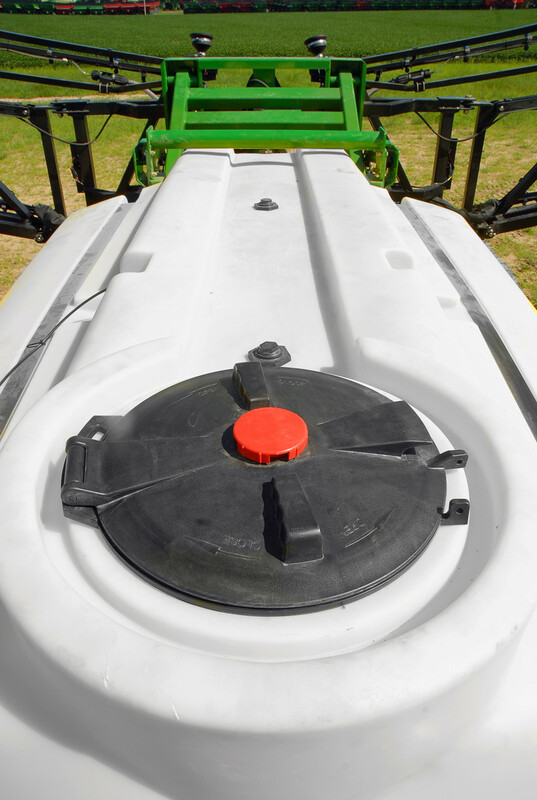 Tank volume indicator with a red float permits easy viewing of the tank fill level from the tractor cab. Centralized control center provides the operator with all the sprayer controls, such as tank agitation, pump inlet/outlet and filter purge, in one convenient area. 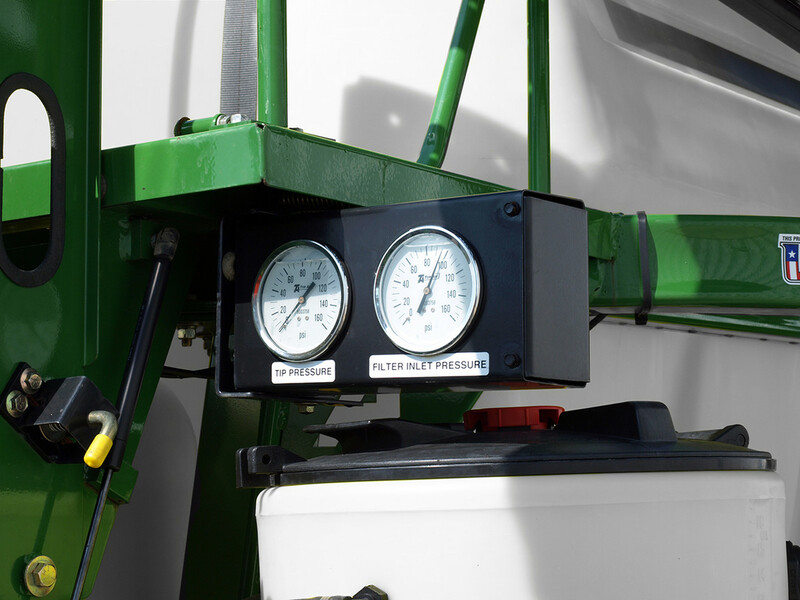 Pivoting pressure gauge allows the operator to easily view from the tractor cab or Command Center. The 9-gallon clean water tank features an eye wash tube and spout for quick response. Ladder with gas-strut assist for easy raising and lowering allows convenient platformaccess, even when the compact boom is folded. 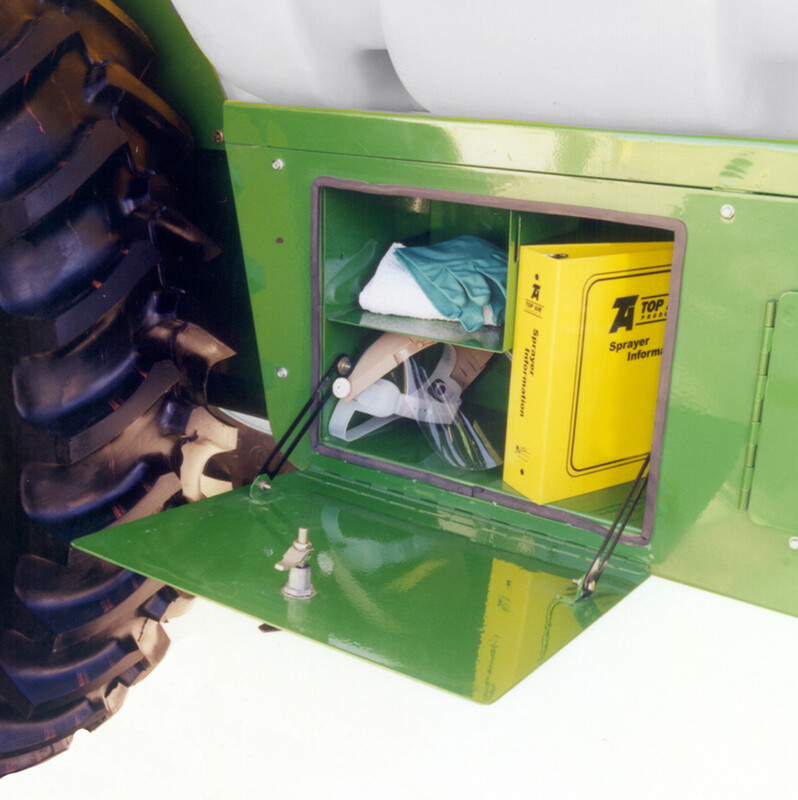 Storage compartment for extra tips, tools and manuals, and a convenient plumbing access door permits easy inspection. Booms feature over 57” of vertical height adjustment from 19” to 76”.Front-folding, tri-fold boom available in 132’, 120’, 100’, 90’ and 80’ widths to meet individual needs. The 132’ boom folds down and operates at 88’. The 120’ boom folds down and operates at 90’. The 90’/80’ boom folds down and operates at 60’. 132’ and 120’ booms feature a 3D design for added strength and durability. Available in 10-section or 6-section with 22”, 20” or 15” nozzle spacing depending on model and boom size selected. 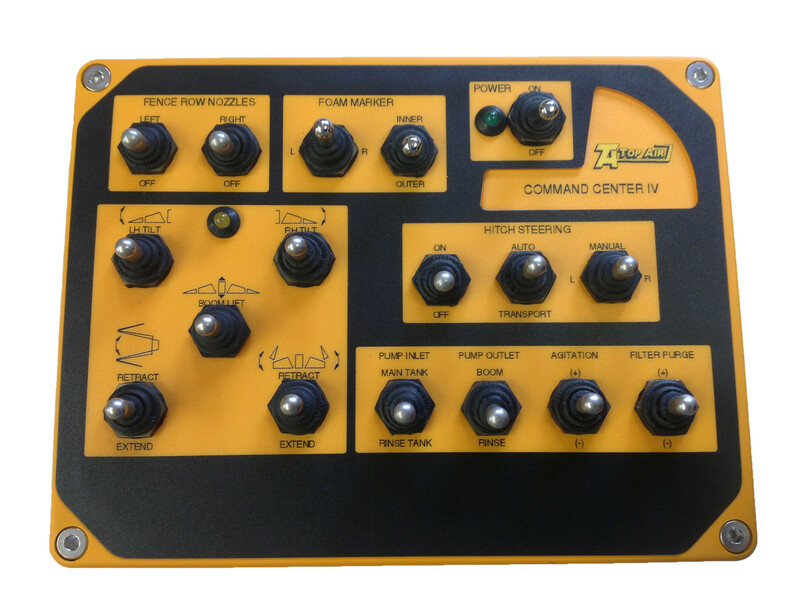 Command Center IV switch box features a robust design, controls all hydraulic boom functions and tank agitation. FLO-BAK® ball valves automatically return remaining fluid in the plumbing at the time of shutoff to the tank rather than out the boom. This unique system saves chemical and money with every shutoff! 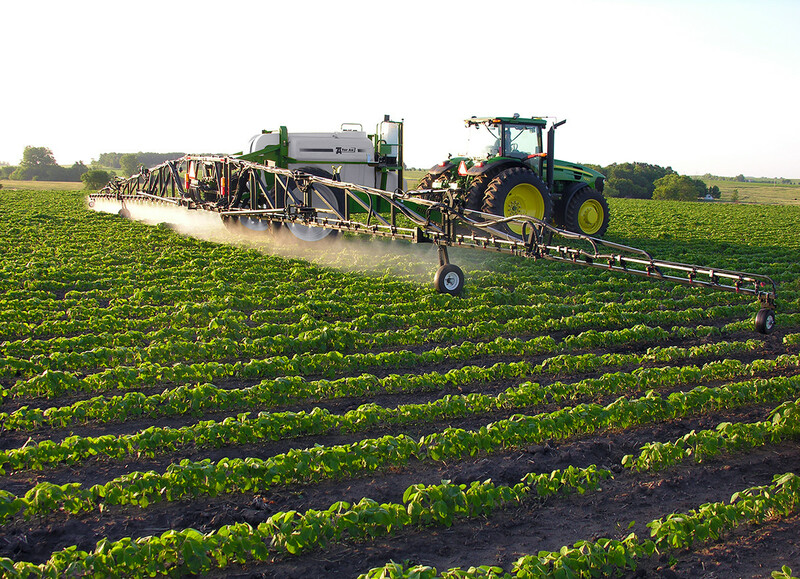 Standard Raven ISO-BUS control provides simple programming of many standard and unique spraying functions. Pressure transducer is included with the Raven ISO-BUS system. Bluetooth connectivity for checking nozzles with the free mobile app. 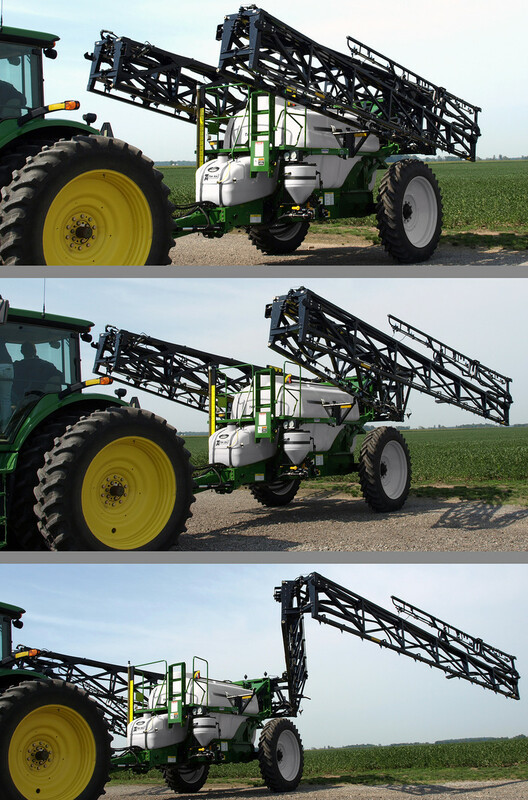 The central pivot system of the boom allows it to stay perpendicular with the trailer for spraying over uneven terrain. Booms are hydraulically adjustable to tilt from 15° above and 5° below horizontal for uniform spraying in uneven terrain. Spring-loaded breakaway system located on the outer wing quickly returns the wing to the spraying position should it come into contact with an obstruction. 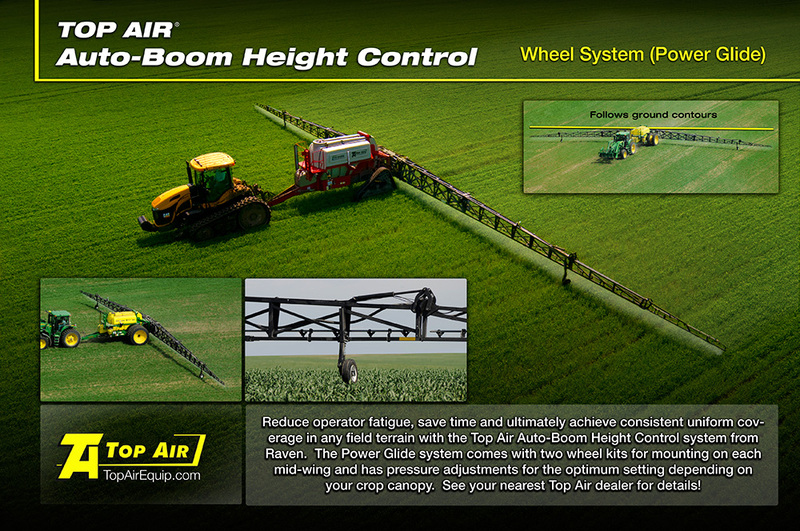 Parallel lift boom system smoothly raises and lowers the boom for consistent application. Nylon wrapping on the hoses provides protection and secures the hoses for longevity and a clean design. 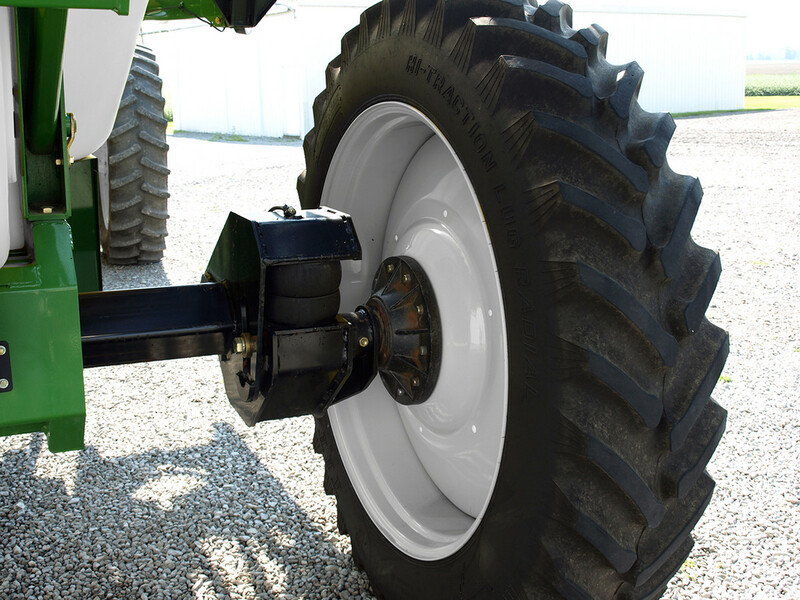 Springs and shock absorbers cushion and stabilize the boom for a smooth ride in tough field conditions. 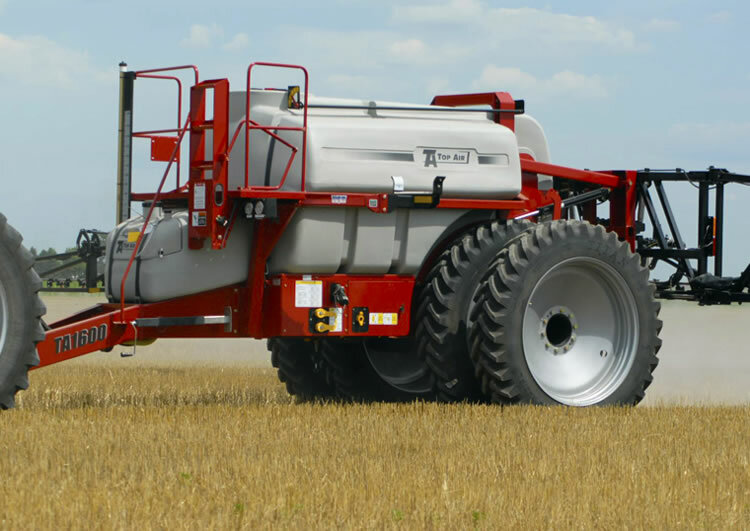 Hydraulic accumulators provide additional cushioning and a smooth boom ride in extremely rough fields. 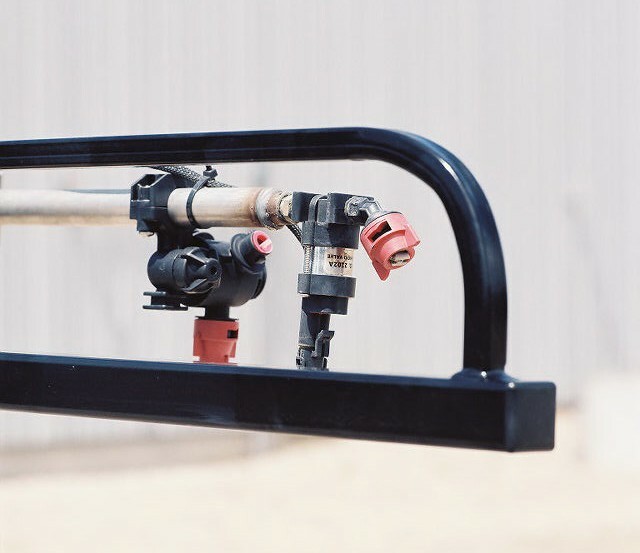 The stainless steel wet boom system provides a tough and durable design for quick response with few joints and connections for less maintenance. Flush valves at the ends of the boom allow for complete cleanout. Stainless steel hardware protects against corrosion and extends the boom life. 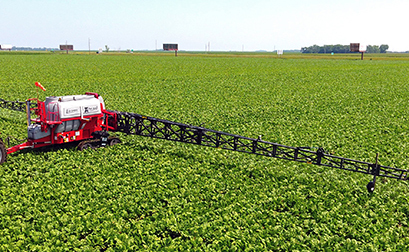 Standard quad nozzle bodies give the operator the ability to change up to four different spray tips for different applications on 15” or 20” spacing. 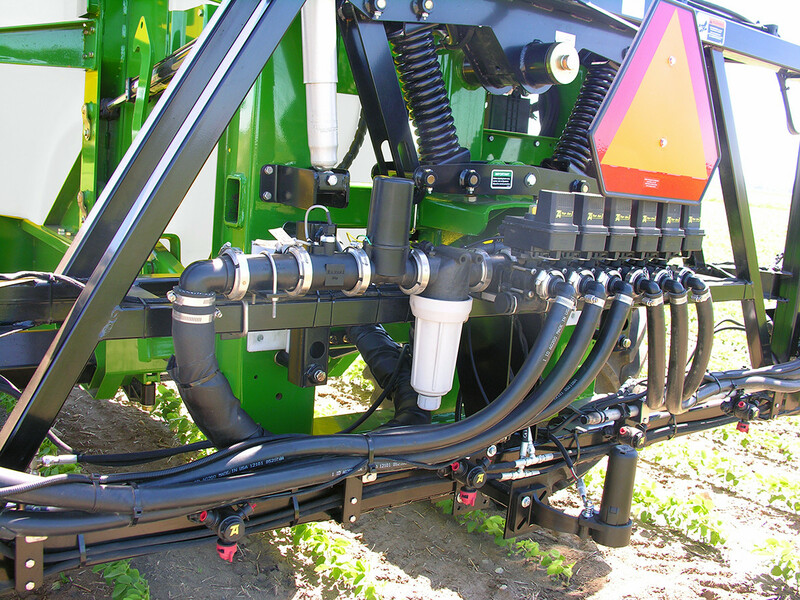 Fence row nozzle kit comes with an angled tip at the end of each boom side and in-cab controls for easily spraying end rows. Booms are painted in a black, high-quality, corrosion-resistant finish for longer life. 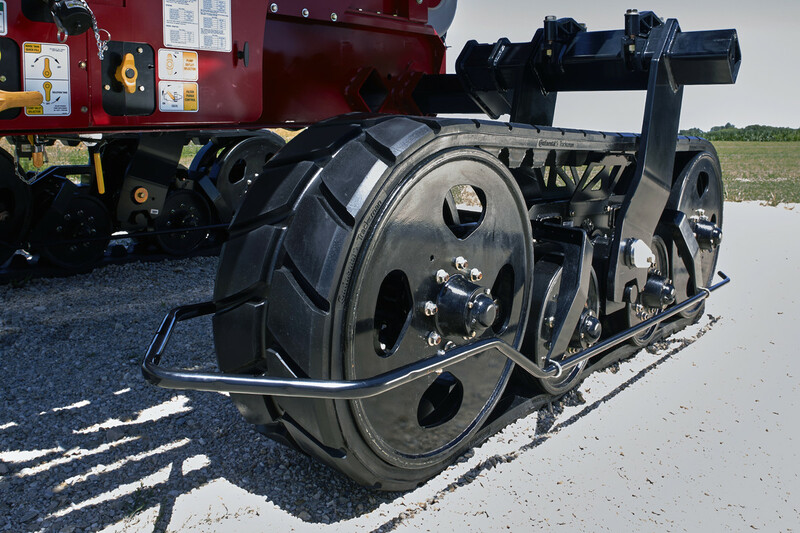 Infinitely adjustable axle allows single wheels and tires to be spaced from 70” to 120”, dual wheels and tires from 60” to 144” and the Equalizer tracks from 80” to 144”. Independent axle suspension allows each wheel to independently move from the other, allowing each side of the axle to adapt to varying terrain. 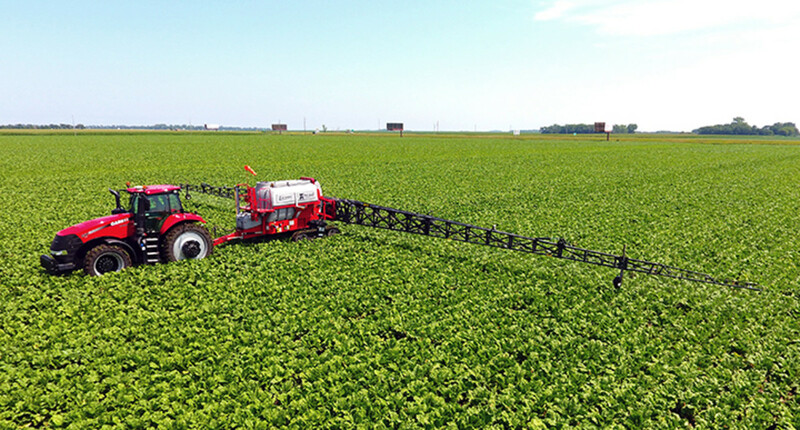 This system provides the smoothest ride over rough ground, allowing for minimal boom movement and faster field spraying speeds. 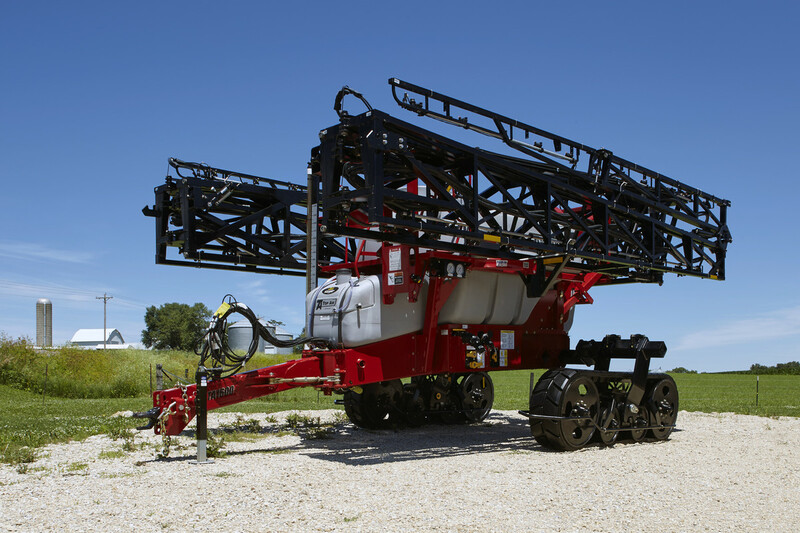 30” of under frame clearance allows the user to spray taller crops, later in the year. A wide variety of single and dual wheel and tire configurations feature 10-bolt hubs with high-tensile steel spindles for long-lasting durability. Equalizer® tracks feature patented front-to-rear and side-to-side oscillation design to follow ground contours for maximum flotation. 14” wide by 80” long rubber track belt is molded as 1 piece, eliminating the need for glued or spliced components for greater longevity. 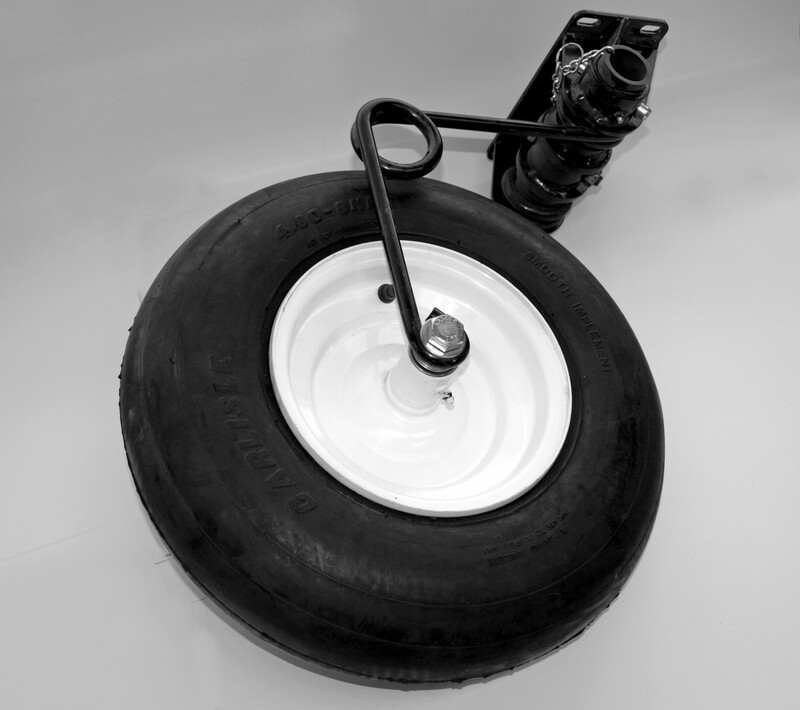 Poly-coated end wheels and bogie wheels prevent dirt buildup. Spring-loaded, self-tensioning idler keeps the belt tight for optimum flotation and belt life. 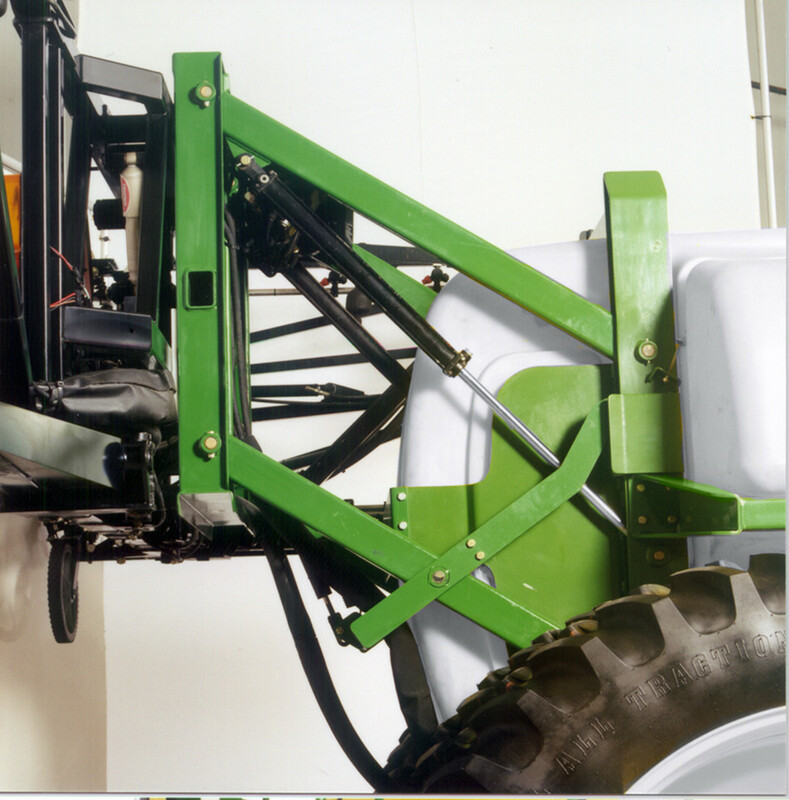 The undercarriage is powder-coated in a high-quality tractor red or green for a long-lasting finish. Lighting, reflective striping and transport chain for safer road travel. 15-gallon chemical inductor lowers to waist level and uses the pressure side of the pump for chemical induction, which protects the pump from abrasive substances and provides faster chemical induction into the tank. Foam marker comes with in-cab controls and utilizes water from the rinse tank to mix the solution at the boom for consistent highly visible foam. 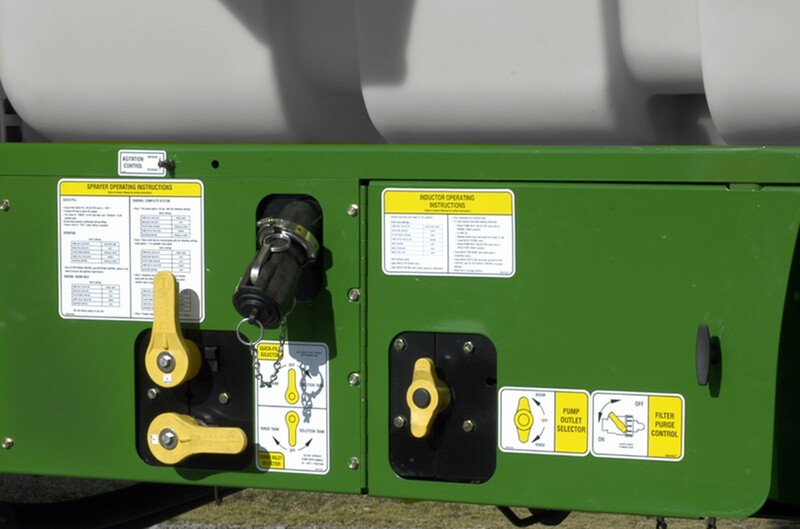 Electric Control Center provides the operator with all sprayer functions on the sprayer controller to easily control from the tractor cab. For example, rinse, agitation and filter purge. 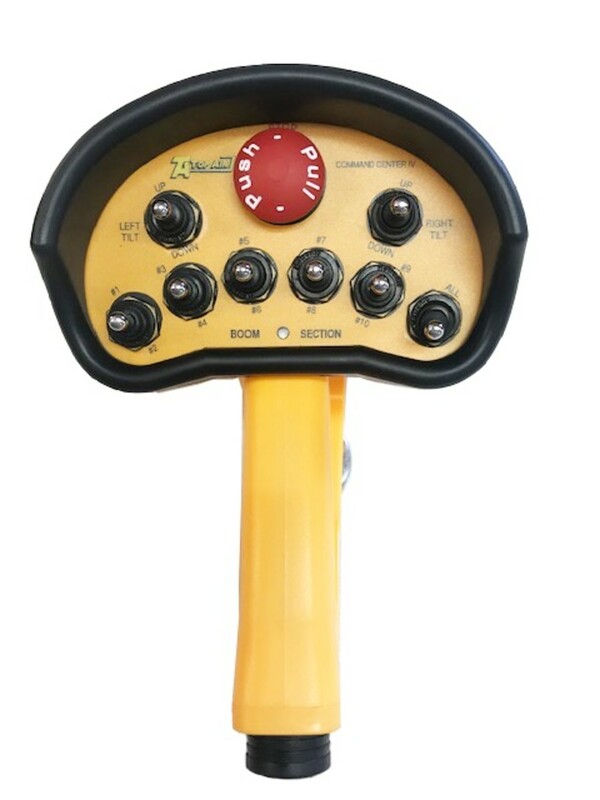 Wireless boom control allows the operator to control the boom tilt and activate the ball valves from a wireless control box. 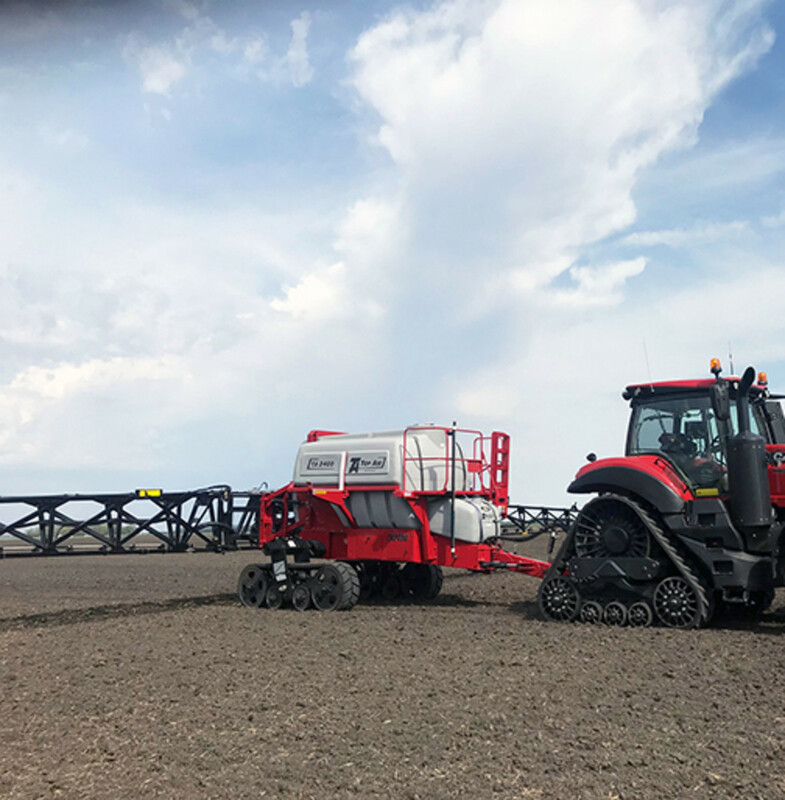 Minimize run-down crop while creating just one set of tracks on the headlands with the steerable hitch. 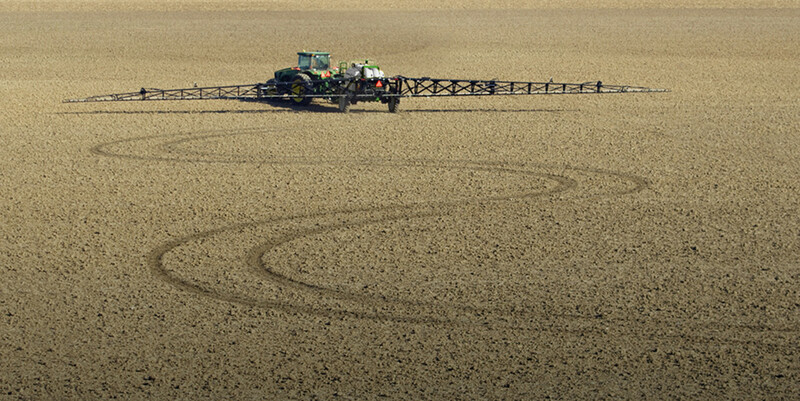 Automatic setting ensures the sprayer follows the tractor on turns and headlands without any operator involvement. Manual setting locks the hitch in the standard position for road travel. ISO Power Glide wheel kit provides wheel-based sensors that automatically maintain boom height for operator ease. ISO Ultra Glide sonar kit and Ultra Glide XT sonar kit uses 3 or 5 sonar sensors to sustain boom leveling and comes with a controller for adjusting sensitivity. 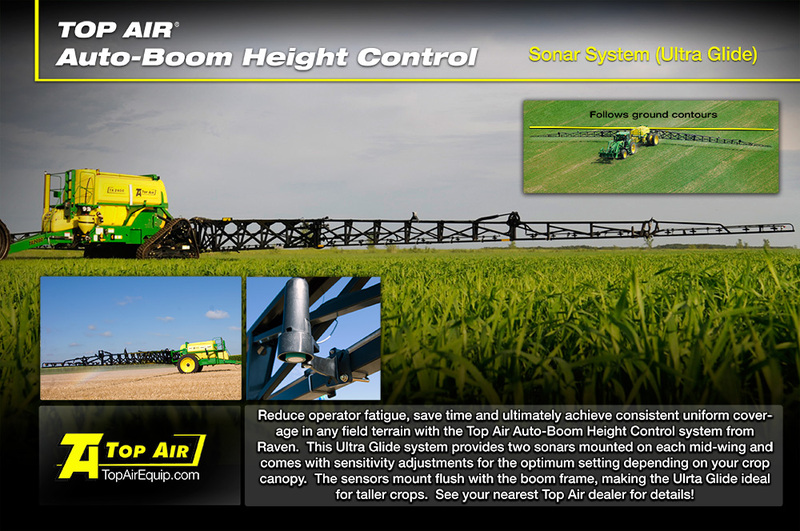 Ultra Glide XT adds the ability to control the pivot of the boom center section. 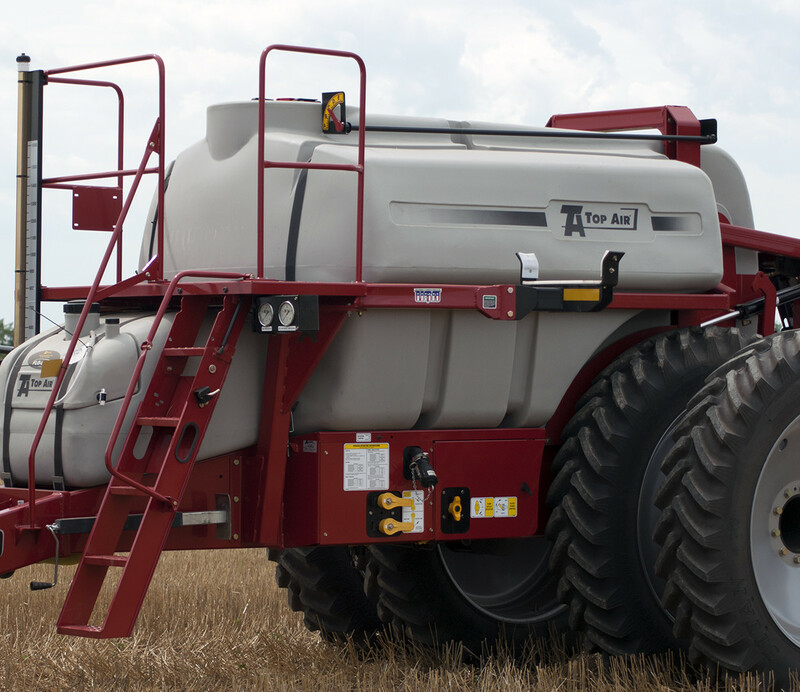 For 6-section sprayers, an in-lieu of Raven 4400 console option is available in place of the ISO-BUS control. Includes an Astro GPS receiver which utilizes speed sensors as a direct replacement for magnetic wheel sensors. The Astro GPS is easily installed and is not affected by crop canopy or tough field conditions. On models 1600 and 1200, the hydraulic Ace 750 PWM (std on 2400) and Hypro PWM pumps are optional to meet individual preferences. 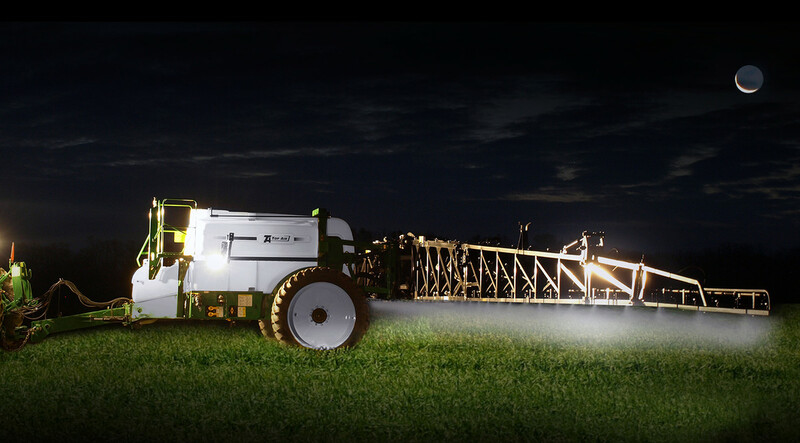 Boom light kit for spraying at night provides greater operator visibility. Boom wheel kits protect the outer boom section in uneven field terrain. 2-point hitch allows for better distribution of tongue weight on the tractor.